This number may include spaces booked, but not yet paid. Payment is required to guarantee your space. Join instructor, Genelle Contreras for our next installment of KIDS@CAM. Works of Natural Art for children ages 6 to 11 years old takes place two a month from March-May. Mix and match days based on your child’s schedule and interests. Per class fee is $12 CAM members/$15 non members. All materials will be provided. Each day children will use both physical and observational skills to create items that will echo things found in nature all the while exploring principles and elements of design such as color, form, composition and balance. March 10—Feather Pins: Kids will paint and draw on feathers then attaching them to pin backs to create fabulous pins that can be worn or gifted. They will even make a lovely backpack swag! March 24—Textured Stone Magnets: Children will work with clay to create a stone like base and then press in plant forms before adding a magnet back. 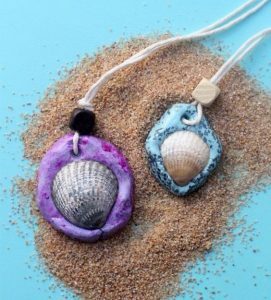 April 14—Celestial Sea Shell Pendants: Kids will shape, mold and paint the pendants before adhering the shell to them. Then they will attach them to necklace, bracelet and/or key chains. April 28—Wrapped Wood Wind Chime: Kids will wrap yarn around the stick focusing on making pleasing color palettes. They will finish off the project by attaching bells and beads to the stick and then assembling the chime. May 5—Dream Catchers: Kids will use both sides of their brains in creating this project that they can then embellish with beads and feathers. May 19—Printing with Plants: Children will create up to 5 greeting cards using the natural pigments of plants and then various other supplies will be used to embellish the cards. Cost for each class is $12 CAM members/$15 non members. Class size: min. 6/max. 12. For online registration visit www.coosart.org or contact the Art Education Dept. at (541) 267-3901. After you submit your booking you will receive an automated "Pending Booking" email with payment instructions. Once payment has been received your booking will be approved by our administrators after which time you will receive a "Booking Confirmed" email guaranteeing your space. Your booking will not be confirmed until payment has been received. Booking does not guarantee your space. Booking AND paying is required to hold your space. You may lose your spot in class if you register, but do not pay promptly and someone else registers AND pays. Please review our Art Ed FAQ prior to registering. $5, $2 for Students & Seniors, Free to Members of CAM. Sat 1-4pm Closed Sun/Mon & holidays Group tours available on request. Our facilities are available to rent.